MoneyWell 2 and 3 have some dramatic changes from our 1.x series. None of the underlying concepts have changed, but how they are implemented has been improved. Follow this guide to help transition to the new event-based spending plan and navigate the redesigned interface. In MoneyWell 1.x, you could only specify a single amount per month per bucket for your budget. Although this covered the basics and was the common design for budget software, it failed to handle real-world spending and radical shifts in income and expenses for many people. Now you have the power of events to drive your budget. Events are similar to scheduled transactions. To add planned income or expense amount to a bucket, you just add an event and give it a name, date, amount, and bucket assignment. You optionally tell MoneyWell how often this event repeats and how often you want to fill your bucket for this event. Think of events like generalized transactions. For example, your "Automobile" bucket isn't just one event with one amount, there are many activities that contribute to the total. You can add a weekly event for filling your gas tank, oil changes every three months, new tires annually, and any other maintenance events. MoneyWell will give you a total and fill this bucket as needed. The biggest advantage of these individual events is seen later when you have to revise your budget. If all you have in your budget is a monthly planned amount for Automobile of $350, it might be hard to revise that. But if you move closer to work and you only need to fill your gas tank every two weeks, all you have to do in MoneyWell is change the recurrence rule on that one event. MoneyWell revises your budget for you and you don't have to guess about a monthly amount or break out a calculator. MoneyWell converts your monthly amounts from version 1 into events, but you'll want to go through and revise them. Instead of just having a single amount for your Automotive bucket, break it out into weekly gas tank fills, quarterly oil changes, annual tire purchases, etc. Use the power of events to flesh out each category of spending and add as much detail as you can to paint a clear financial picture. Make sure you define all your income and bonuses as well so you can see the comparison of income to expense. MoneyWell gives you a quick look gauge in the header to show the planned spending versus income in the current period and the bar graph will show a breakout per period of how the two sides of your budget match up throughout the year. You can even move the date range slider back to show the existing spending prior to today and get a visual of that compared to your planned amounts. Once you get your budget looking good, you can move onto resetting your cash flow. Bucket transfers—formerly called money flows—are cash flow movements between buckets. They don't affect your banking side of your finances and will only show up when you are looking at buckets. There are two types of bucket transfers: the automatic ones that MoneyWell creates and attaches to events and the manual ones you create. During the conversion process, MoneyWell changes all your existing bucket transfers to manual ones. This is done for two reasons. 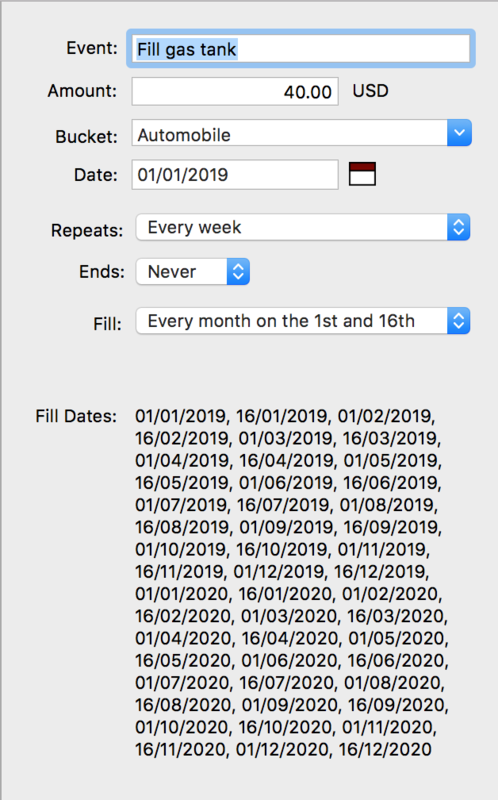 The first being that you will most likely be revising your converted events and attempting to attaching bucket transfers to them would be difficult, if not impossible. The second reason is that MoneyWell will attempt to revise automatic bucket transfers if you fill a previous plan period. Switching them to manual transfers tells MoneyWell to leave them alone. The best way to get a clean cash flow picture is to restart your cash flow for the current period. 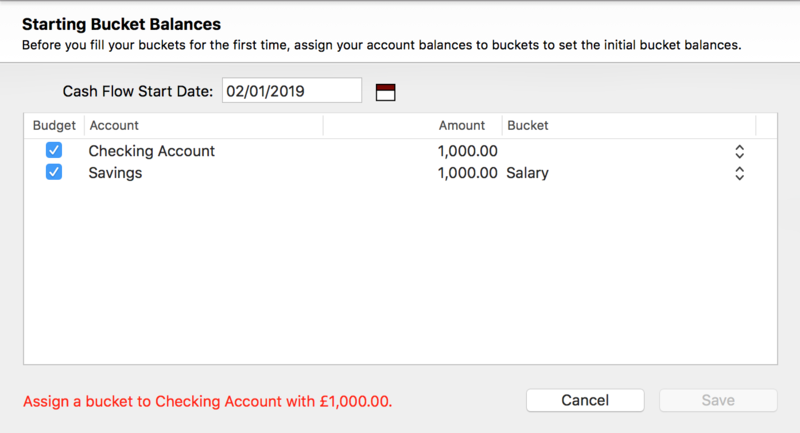 This will allow you to remove manual bucket transfers that could be confusing during the current plan period and to start with a clean slate showing balanced bucket and account totals. Now you should have a clean slate for your cash flow. When you have All Transactions selected in your source list you'll see a "Cash flow balance: " value in the header. If your account balance total doesn't match your bucket balance total, you'll also see an "Accounts are under/over by: " value. This alerts you that you have a transaction that is in one of your cash flow accounts, but doesn't have a bucket assigned. It could also mean that you have a bucket assigned to a transaction in a non-cash flow account. Deliberate Filtering - Over the years, we responded to so many support emails asking why buckets were missing transactions. The simple answer was that a single account was selected and the customer needed to click "All Accounts" before reviewing the contents of a bucket. This filter was not very obvious and caused plenty of confusion. Filtering a bucket by account should be obvious and intentional. In MoneyWell 3, only a single item is selected by default in the source list. If you click on a bucket, you get all the transactions in that bucket displayed. Select an account and all the transactions in that account are shown. To filter the transactions to only ones in both a specific account and bucket, click on the account, then hold down the Command key (⌘) and click the bucket. This eliminates accidents while still giving you the power to filter your lists and reports using any combination of source list selections. Focused Tasks - Managing your budget was done in a small drop-down panel in version 1 and locked you out of doing anything else while you were doing that task. You couldn't leave it without saving or discarding your changes. In MoneyWell 3, budgeting is a first-class citizen and gets its own view. Simply click Spending Plan at the top of the window to switch your view to the new events list. This also allows MoneyWell to reuse the buckets list for the filtering of the spending plan. The same goes for the banking side of MoneyWell. Reconcile is just another view at the window top. Click it and use the accounts in the source list to update your bank statements for each one. The goal with the new UI was to give you the ability to flip into Lion's full-screen mode and immerse yourself in a task without limitations of dialogs and panels. Switching between any of the five main views is as easy as holding down the Command key (⌘) and pressing 1 through 5, respectively. Clutter Reduction - Each of the sections in the source list can be collapsed so you can focus on buckets, accounts, or securities without the others taking up space.